Nog - Gryffindor. The first Ferengi in Starfleet, he displays a lot of courage in defying his uncle’s wishes and going where no Ferengi had gone before, and allying himself with humans. He learns a lot about bravery, morality, and what’s right in his time with Starfle. 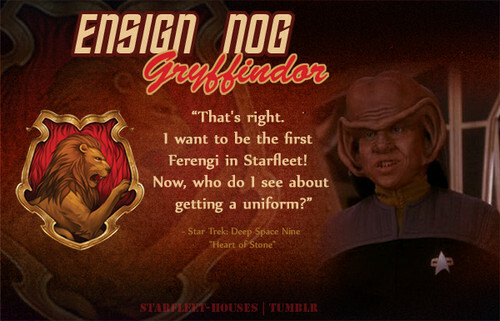 Wallpaper and background images in the nyota Trek: Deep Space Nine club tagged: deep space nine star trek ds9 trek meets hogwarts gryffindor nog ferengi. This nyota Trek: Deep Space Nine fan art might contain ishara, bango, maandishi, ubao, matini, ubao wa chokaa, anime, comic kitabu, manga, cartoon, and mkono.